Dendromass4Euope (D4EU) aims to establish Short Rotation Coppices (SRC) in South Central Europe. What looks a bit like the beginning of a new forest is actually an agricultural crop. SRC crops can be converted back into annual crops again, because the real estate will hold the legal status “agricultural land”. It will not become a “forest”. SRC are additional and newly established wood resources outside of the forests and disburdening these from the utilization pressure. Thus, SRC are an appropriate response to the predicted wood supply gap in Europe and to the increasing demand for biomass in a growing bio-based society in Europe and all over the world. 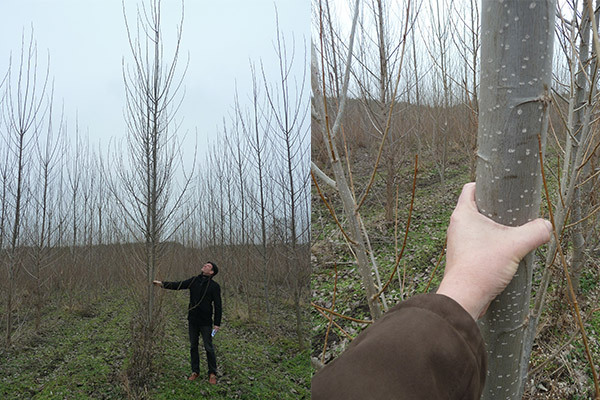 The picture shows a two-year-old poplar in our SRC in Slovakia. Brian J. Stanton from GreenWood Resources (USA) explains: “Poplars are the fastest growing tree species within the temperate zone with biomass growth rates of current varieties approximating 10-15 dry Mg per hectare and year on four-year rotations with some varieties exceeding 16 Mg per hectare and year.” With annual growth rates up to 35 cubic meters per hectare SRC can produce more than twice as much wood as other typical forest tree species such as spruce or larch. Remark: 1 Mg (1 Million gram or Megagram) is equivalent to 1 t (ton).